This delicious and creamy berry croissant bake makes for a nice breakfast casserole or dessert. 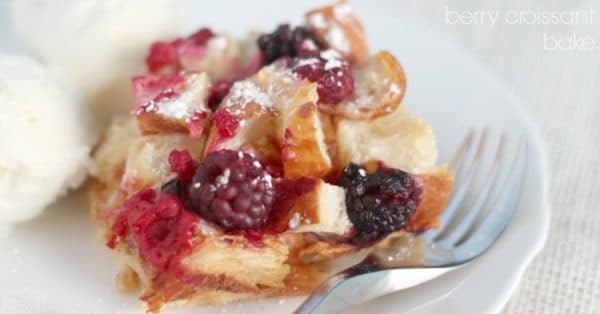 Sweet Berry Croissant Breakfast Bake Recipe! Simple, easy, and delicious. This berry croissant bake is perfect as a special breakfast or a dessert. I love it as an Easter dessert! The women in my family have a soft spot for dishes like this, so it would be an awesome Mother’s Day treat too. How about as a Christmas breakfast bake? Yes, definitely! Fresh or frozen fruit works in this recipe, but frozen is super easy and convenient year-round! Try fruits like strawberries, raspberries, blackberries, peaches, blueberries, and so on. Yum! My favorite so far is raspberries or a berry mix. Add lemon zest or almond extract for some additional flavors, if desired. There are so many fun variations that could happen here! The number of croissants needed for this recipe is an estimate since croissants are not all the same size, but I use about 5 large croissants from Costco in a 9×9 pan. For a 9×13 pan, you may end up doubling the number of croissants. As I said, this recipe is really simple. There are only a few steps to it. Start by tearing up your croissants, placing them into your 9×13 baking dish and topping it all with your choice of berries. Then, pour the cream cheese and milk mixture over the dish, and let the croissant pieces soak it up for at least 20 minutes, then bake it up. You can also prepare it to this point, then cover, refrigerate overnight, and bake in the morning. The croissants lend their buttery, delicious flavor and the top of the bake becomes slightly crisp. Whoever thought up using croissants in a dish like this is a genius! The texture is similar to bread pudding with a slight cream cheese flavor, and I love the addition of fruit. This croissant bake recipe is definitely a hit! Sprinkle powdered sugar over top for a pretty finish. Serve with ice cream, whipped cream, or a fruit syrup to make it an even more decadent dessert! To make this croissant bake recipe as individual servings, use 10 4-ounce ramekins or 5 8-ounce ramekins. Reduce baking time to about 20-25 minutes. This is a great way to have a tasty, on-the-go breakfast! See more of our favorite breakfast recipes. Would you like to see more of our favorite recipes? Subscribe to our recipe email. In a medium bowl, beat the cream cheese and sugar until smooth and creamy. Add eggs and vanilla, beat until combined. Gradually beat in milk. Pour mixture evenly over the croissant pieces and berries. Let stand for at least 20 minutes, or cover and refrigerate overnight. Serve warm with powdered sugar, ice cream, or whipped cream. Double recipe for a 9x13 size.